Ryan Donaldson is out of contract at Hartlepool in the summer. Ryan Donaldson is keen to stay at Hartlepool United next season - but hints talks are yet to start on extending his Super 6 Stadium deal. Since Craig Hignett returned to the dugout Donaldson has been trusted with the Pools armband - and the winger admits he's loving every minute of the extra responsibility, and life under his manager. 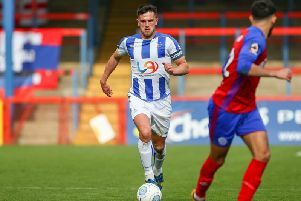 "Everyone would love to stay at Hartlepool United - it's a great place to be," said Donaldson, whose side take on automatic promotion-chasing Solihull Moors on Saturday. "Everyone loves playing for the manager and even though we lost at the weekend, we feel like we are playing well at the moment. "We all want to stay but the only thing to do is keep your head down, get on with your job. There is only a month left of the season and we will see what happens at the end of it." Manager Hignett has made it clear he will start talks with the club's senior professionals, Donaldson included, over the next week with deals for next season in mind. Some players will be told the are wanted, others will be told they are not part of the plans. Donaldson, as mentioned, is hopeful Hignett will want to offer a new deal - but hints no talks have yet begun. When asked, the skipper replied: "There is still a lot of time left in the season - a month is a long time. "We are all just getting on with the job in hand, there is a lot of football to play still and we want as many points as possible."